I will start off by saying the hubby and I are not millionaires by any means, in fact we get by week to week, paycheck to paycheck. We were never the type to be able to pay cash for our home, my vehicle, any of that. In fact neither of us grew up in a wealthy family, yes our needs were always met, but there was never money for college or financial advice really given. My parents struggled to provide for us and so did his family. When we got married we weren’t very smart with our money, in fact we made a HUGE mistake and decided to “consolidate our debt” with a loan… a loan we ended up paying almost 100% interest on after it was said and done. Horrible experience and a very hard lesson for us both. When we paid that loan off we decided to get our finances in order, while we may not be able to pay everything or anything off at once, we needed to pay our bills on time. I am okay with being broke for the week when I know my light bill and mortgage are paid, it’s a lot easier to be broke when you know you have a roof over your head. So how do we keep our bills organized? We’ve tried many different methods throughout our marriage and the calendar method is by far the easiest and most organized for us! In fact this method helps us see how our finances will be week to week, being able to see our pay days and due dates on the bills helps keep us organized and to know when we will have a little extra and when we will need to put some up for the next week. At the beginning of every month I take all our bills and write them out in the calendar including due date and the amount due. Every time a bill is paid we highlight it to show that it’s been taken care of. I keep all our bills, envelopes, stamps, etc. in the calendar so everything is there when we need it. Does this help us pay OFF our debt? It could, but frankly, we can’t afford that. We can afford to get by week to week and pay our bills as they come due. 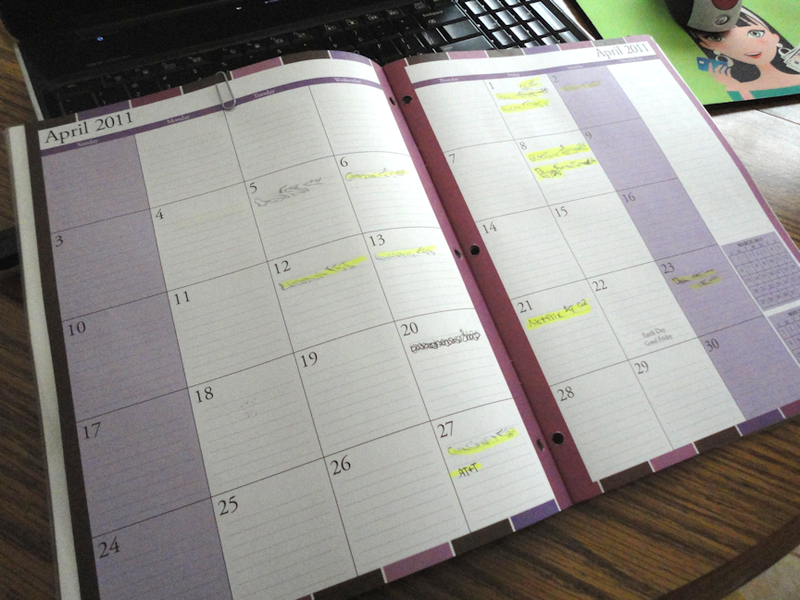 Keeping due dates and income organized with the calendar helps to see what we are looking at for each month. How do you organize, is there a method you’ve found that works best for your family? Every two weeks my husband and I write out a bills list. We put the paycheck amount on the top and how much is in the bank. We add that together and from there take away all of our bills, food, and gas. Then we give ourselves an allowance, which we can not go over. Whatever is left will go into savings. As soon as the paycheck is deposited I pay all of our bills online. My parents have done it this way for 25 years, and it work well for us too.As soon as the paycheck is deposited I pay all of our bills online. My parents have done it this way for 25 years, and it work well for us too. Our family uses a massive 14 tab spreadsheet: 12 monthly tabs, the main budget tab to make any changes and the end of year tab to show where all of our hard earned went. It takes just a few minutes to enter everything in each pay period. I love that it keeps a yearly total to plan for the future. I do have to keep a file folder on my desk for those random bills that come in from time to time. We do not have a budget for those items but plan when we will pay them at the beginning of each month. Jennifer, I know the very, very bare basics of excel spreadsheets, how do you get the 12 months to total up like that? I use a large manilla envelope for each month. I list the bills that are due that month in order of due date on the front and keep the bills inside the envelope. I check off when they are paid. I also keep track of how much we owe on each one and can add up our total debt each month and compare to the last month to see how much we have reduced our debt that month. It keeps it all in one place and is easy to see at a glance what is due without searching for the bill. I also use an Excel spreadsheet. One tab is my 'Checkbook Register' (although I haven't written a check in ages), it tally's my balance of our checking account. Each row is either a deposit/withdrawal. I found a handy one years ago online that I have changed around to meet my needs. Other tabs are months of the year. I copy/paste the bill list from one month to another, update the due date column and amount if it changed (like water bill, etc.) On the same tab I have a calendar for that month so I can visually see paydays/due dates and then a list of the deposits (paydays) that will occur that month. I have a bold line in between the bills to show me which payday what bills will be paid. As they are paid I put a Y (for Yes) beside the item. For unexpected bills (i.e. doctor bills, etc.) I pay those the month or within 30 days of receipt. We put our extra money towards one out to eat per week, a little for extra purchases (clothes, etc.) and remainder to savings (about $1,500 per month). Works well ! My DH always took care of our finances until about 3 or maybe 4 years ago and I noticed he was transposing numbers and he couldn't balance the bank statement when it arrived. What confused him was the way some items were processed. I agreed to take it over and since I worked in the banking industry for 16 years prior to my retirement, I had no problem taking over. We've always had a savings account but not a regular deposit so in 2015, one of my goals is to start out the first of the month with the amount of his retirement check and transfer any remaining balance from the month before over to savings. He used to take out large amounts when he went to the bank to cash a check that was to last us for the month. Well, he was determined to keep that large amount in his wallet. His Father did the same thing. In today's world, it is not safe to do that. He has a hissy fit if I go to the bank 2 or 3 times a month to cash a check. I know us, the more we have in our wallets, the more freedom we feel to spend it. Not really blow it for foolish things but if we want to go out to dinner, we do it. Our only enjoyment is going out to lunch or dinner. We are not clothes hounds but I do need clothes badly and he needs some more dress pants. I already know he's going to bulk me on my idea; it's his insecurity showing..We eat too high off the hog for groceries too. I left $176 in the grocery store this morning but I did buy extra stuff that we use on a routine basis that was on sale. It will save me from going to the store in the harsh winter months ahead. I am willing to cut back but he is uncomfortable with it. We're driving a 7 year old car but need another one that he can get in/out of better as he is somewhat handicapped or let's say inmobile. I'd like to be saving more and that's my goal right now for 2015. I use a form that I found online somewhere that Lists the Bill Name, Amount Due, Date Paid, Date Due, Check Number (if Paid by Check), Balance, Comments. I fill it in for My Bills, My Husband's Bills, The Household Bills in 3 separate sections. -- Then on the side I write what section is which, then I highlight My Bills Section Name Pink, My Husband's Blue, The Household Section is Green. -- Then as each section is filled in I then draw a line under the amounts then in the space to the left I write the word Subtotal which I highlight Orange. I do this for each section. -- Then We total up all the Bills and place that amount at the bottom of the first column which we call Net Expenses and highlight Yellow. -- Then after my husband pays the Bills online with Automated Payments he writes at the bottom of the form the Actual Amount Paid and Deducts that from the Net Income in our case his SSI Benefits and this determines how much money we have left ....or as in some months how much we overspent. I really need to get back to doing this, I have been lazy that past few months since my Husband is keeping track with an Excel Spreadsheet that he shares with his older brother on the months we need help. I sure hope this is clear enough to understand. The Chart I use can be found at http://www.chartjungle.com/home/bill-payments-monthly-blank.html It is called Bill Payments (Monthly) and authored by Wendy Shepard.